← Marking – Your Dog Has the Last Word? Exercise – Is it Always a Good Thing? Recently I had an unresolved discussion with a couple of dog trainers about a chronically stressed small dog and they suggested that he needed more exercise and more training – agility perhaps. My view is that the dog’s stress levels need to be reduced in every way possible at home before they do any training as such and that exercise should be as gentle, undemanding and pressure-free as possible. Perhaps we are both right. Lack of appropriate stimulation can cause stress, particularly in an intelligent and energetic dog, but too much exercise and of the wrong kind, particularly if it involves being ‘trained’, pulling frantically, fear of meeting other dogs, repetitive ball-throwing, etc. I believe completely wipes out any benefit that a walk might give. 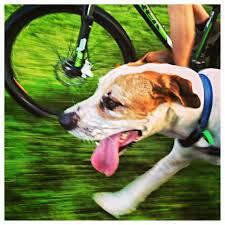 Physical exercise is obviously needed by all dogs – but quality counts. Sarah Reusche in her blog ‘Too Much of a Good Thing: Over-excitement in Exercise’ says, ‘Today we’ll discuss one of the biggest problems, over-arousal due to exercise, and the myth that you should exercise “crazy” dogs more’. She says, ‘A highly aroused dog will be very excited, with a fast heart rate and respiration and poor impulse control. He may have dilated pupils or chatter his teeth. He may pant, jump around or on you, or vocalize incessantly. He may become grabby or mouthy. Alternatively, he may become “locked on” to an activity, freezing in place and staring intently at the object of his obsession, spinning in circles, or pacing’. Stress hormones (whether from excitement or from fear) can last for several days and will spill over into all aspects of the dog’s life. The wrong sort of exercise or too much stimulation is merely adding stress to stress. The psychological aspect is only one side of the debate. What about the dog’s bones and joints? Karen Soukiasian on www.dogsbestlife.com explains how ‘forced’ exercising can seriously injure a dog. I do personally know of one such dog (not a client), and the exercising has continued despite operations on the dog’s leg and even during the recuperation period. People’s belief in the necessity for exercising a dog no matter what can almost amount a religion. She describes forced exercise as any repetitive motion which causes stress on young developing joints and bones in particular. That includes jogging, biking, rollerblading, skateboarding or even sled/cart pulling. I would add running beside a bicycle. People do not realize exercising young dogs thus can be causing a lifetime of serious damage and pain. Large and giant breeds may not complete the growth process until they are approximately 2 years old. ‘I am curious that over the last few days Freddie has started to sniff and stop more when we are walking,walking along sniffing the floor not pulling.I am taking this to mean he is less agitated and therefore more curious about his surroundings.This morning I chose to walk along by the road away from the path on the grass about 10ft from road.He was sniffing and searching.This totally distracted him from the passing cars,I also praised him for this and gave him chicken.He alerted to one dog although I turned around and he was fine’. This entry was posted in Science & Health and tagged exercise, exercise benefits, jogging, joints, over exercise, over stimulation, pulling, running, running by bike, stimulation, stress, walks. Bookmark the permalink.